"Higher Learning through the Sport of Baseball." Children ages 4 to 18 come from all over in order to participate in our programmes which include practice to gain baseball skills, summer camps, and tournaments. No child who expresses an interest in the sport of baseball is turned away from our programme. Those who cannot afford the annual membership fee are welcomed on our fields. If a child has no bat or gloves or even baseball shoes, he or she is provided for. Baseball is a team sport, and therefore the team spirit induces in our children the ability to get along with each other. Each child is treated with respect and is exposed to the discipline and standards that is required from our players. The Freedom Farm Baseball League was started in 1989 with four (4) teams on the grounds of Freedom Farm, Joe Farrington Road. In 1993 the League got a new home situated in Yamacraw Beach Drive. At the time of the move the property was virgin ground and the league, with the help of its faithful parents, began a major fund-raising effort to develop this site. To date, Freedom Farm has grown to 42 teams! We now have one T-Ball Field, Two Pony League Fields, and one Minor League Field. 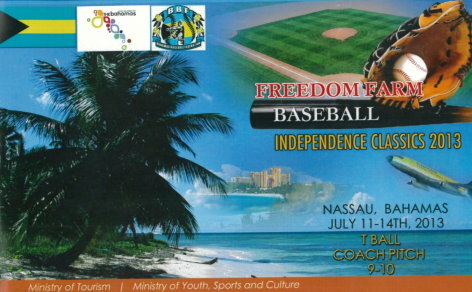 Freedom Farm participates in a number of tournaments, both within The Bahamas as well as outside. Over the years, we have taken players to tournaments in Tarpum Bay and Spanish Wells, Eleuthera, Freeport, Grand Bahama, West Palm Beach Fl.,Orlando Fl. (Where the Coach Pitch team was the winners of the 2011 Metropolitan Junior Baseball League), Sarasota Fl., Lakeland FL. (Where the 11-12 baseball team was the 2010 Southeast Regional Champions of Cal Ripken Babe Ruth baseball league), okeeheelee Fl. (Where the Coach Pitch team was the 2010 champions for the 2010 coach pitch independence classic) Demopolis Ala., Morgantown NC., New Bern NC., Wilson County NC. (Where the 11-12 baseball team was the winners of the Major/60 World Series 2010 Cal Ripken Babe Ruth baseball league), Virginia, Ontario Canada, and Henderson Ky. (where they were the invitational team to the Bambino World Series). With over 22 years behind us, Freedom Farm can now boast that, because of the training and exposure they have received at Freedom Farm, its first group of players, consisting of over 50 young men and women are now receiving, or have just about completed schooling overseas. These educational opportunities became available because of the doors Freedom Farm opened through its highly respected system of training and discipline that is rendered to each of our players. Many of these young people assist us with the Freedom Farm Summer Camp and other activities when they are home.